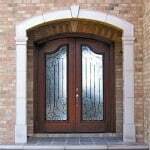 This simple but Elegant Country French Exterior Wood Entry consists of a pair of common radius 30″ x 108″ Doors. The “S” Curve Center Rail adds subtle character to the Unit. It is shown with Rocky Mountain Hardware.